Months and months ago, I bought six cans of pumpkin puree in preparation for the Fall baking season, and look what we have here — *opens pantry door* — five cans of pumpkin, totally untouched. BLASPHEMY! It’s nearly November and I’ve posted ONE pumpkin recipe this entire chilly season (#foodbloggerfail?). 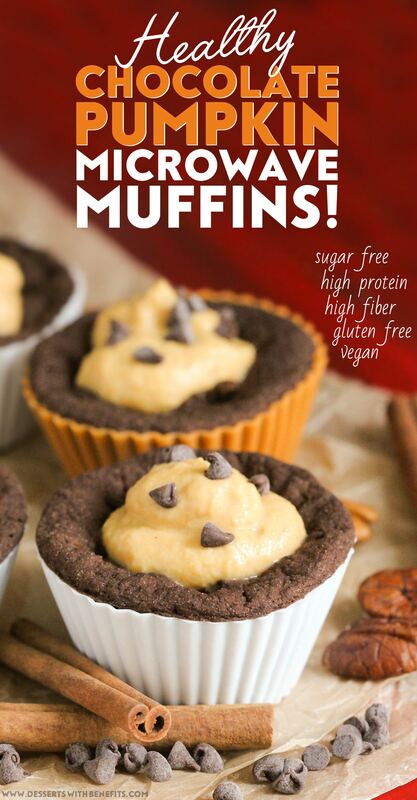 But don’t worry, I’ve redeemed myself with these Healthy Chocolate Pumpkin Microwave Muffins! They’re dense and sweet, chocolatey, and lightly spiced. You’d never know they’re sugar free, high protein, high fiber, gluten free, dairy free, and vegan too. Do you see that muffin right up there? That’s pure chocolatey pumpkin bliss. If you want to indulge in chocolate but you’re craving some pumpkin, because, you know, it’s FALL and all that, make these Healthy Chocolate Pumpkin Microwave Muffins. THEY WERE MADE FOR YOU. Better yet, if you’re super impatient (like me) with a hankering sweet tooth (also like me), then this super quick and easy recipe will hit the spot. You’re less than 5 minutes away from this chocolate-pumpkin goodness. Yeahhhh, this is the life. They’re dense yet soft, like every muffin should be, and filled with nutritious ingredients like flax, pumpkin, oats, and cinnamon. 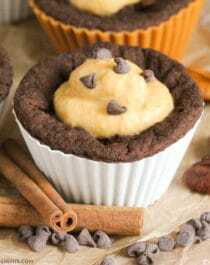 These Chocolate Pumpkin Microwave Muffins are the best of both (chocolate and pumpkin) worlds! These Chocolate Pumpkin Microwave Muffins are dense yet soft, like every muffin should be, and filled with nutritious ingredients like flax, pumpkin, oats, and cinnamon. In a medium-sized bowl, stir together the ground flaxseed, almond milk, and pumpkin puree. In a small bowl, whisk together the oat flour, cocoa powder, baking powder, cinnamon, sweetener and salt. Dump in the wet ingredients and whisk together. Spoon batter into 4 silicone cupcake molds and microwave for ~2½ minutes. Let cool slightly, then enjoy! Because this recipe is sugar free, contains healthy fats, a whopping 16g of filling fiber and 10g of protein (!!! 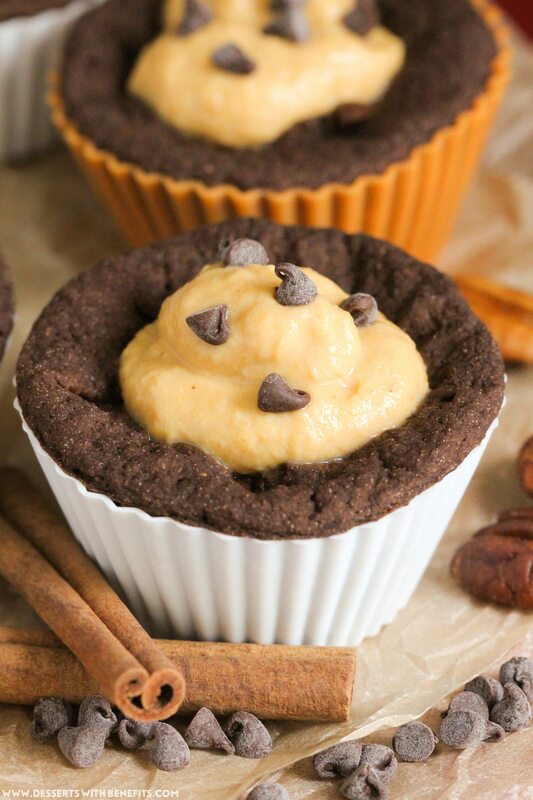 ), these Healthy Chocolate Pumpkin Microwave Muffins will keep you fuller for WAY longer than some typical ole bakery-bought chocolate muffin or pumpkin pie. If you are feeling indulgent, add a tablespoon of mini dark chocolate chips to the batter. After “baking,” feel free to frost the muffins or spread them with Pumpkin Butter, Apple Butter, your favorite nut butter of choice, drizzle ’em with pure maple syrup, or just top them off with all-natural whipped cream! Whateva tickles yo fancy. So much deliciousness, so little time! This blog it’s GREAT! Thank you for all the healthy DELICIOUS recipes! Can I use Almond Flour or Coconut Flour instead of Oat Flour? I wouldn’t use coconut flour because it absorbs too much liquid, but almond flour might work! I love your recipes and site! Thank you!!!!! I’ve never shipped food before so AHHHH I’m not sure ? Sorry! Is it possible to make these individually in a coffee mug? “Cake in a Mug” type thing. I want to try this but do not have silicone cupcake molds on hand. Will definitely get some soon though! Have you ever experimented with baking them in the oven? I don’t have a microwave where I live, but these sound delicious! We have made these several times over the last few days with some subs since we live in Zambia. They are a family favorite! So yummy. Can you tell me how you got the nutritional values? We’d like to try and recalculate for our substitutions, and having a hard time knowing if we’re accurate or not. Thanks so much for making great recipes! You calculate the nutritional information by adding up the servings in each ingredient for the quantity you’re using, then divide that total number by how may muffins you make. I made the regular version. It was good but next time I will mix the dry ingredients first because it had a slight baking powder taste. Thanks for the easy recipe!